"This recipe is the perfect compliment to a nice filet or ribeye. It's a little time consuming, but well worth it in the end. It adds the perfect amount of spice without going overboard. I got the idea from a local steakhouse, but I made it my own." Spread 1/4 of the sliced potatoes into the bottom of the casserole dish, followed by 1/3 of Gruyere cheese, and about 2 tablespoons of minced jalapeno peppers. Sprinkle with salt and pepper. Repeat the layers 2 more times; top casserole with last 1/4 of the sliced potatoes. Pour the cream evenly over the casserole. Sprinkle top with paprika. 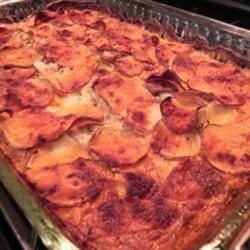 Bake in the preheated oven until the casserole has browned and the potatoes are tender, about 1 1/2 hours. I used lowfat cheese and fat free half and half with amazing results. Delish!! SIMPLY DELICIOUS!!! Made according to the recipe except I used serano chilis instead of jalapenos. This was great. A very nice side dish with a little zip. Not too spicy but good flavor. Yum!! If you like alittle zip to your meal make this. You can adjust the heat to your taste. We like hot and this was purfect without being too much.